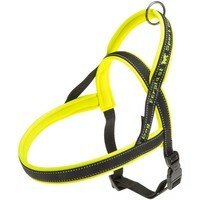 Ferplast Sport Dog Harness (Yellow) has been made of strong nylon materials and given a sporty appearance, with thick, soft padding in fluorescent colours. Designed in the Swedish style of harnesses that are built specially to make them really easy to put on, the harness also features reflective stitching and a sliding clasp made of plastic for easy adjustments. The harness also features a padded handle on the top to make it easy to keep your dog under control, especially during training or in situations of danger. The handle also has a solid metal ring as a secure anchor for attaching any lead too.